> Your Horse, Pendant and Chain. Your horse in a 18ct gold plated, sterling silver or 9ct gold setting. This pendant and chain is available in sterling silver, 18ct gold plated or 9ct gold and is inlaid with a choice of image that you supply. 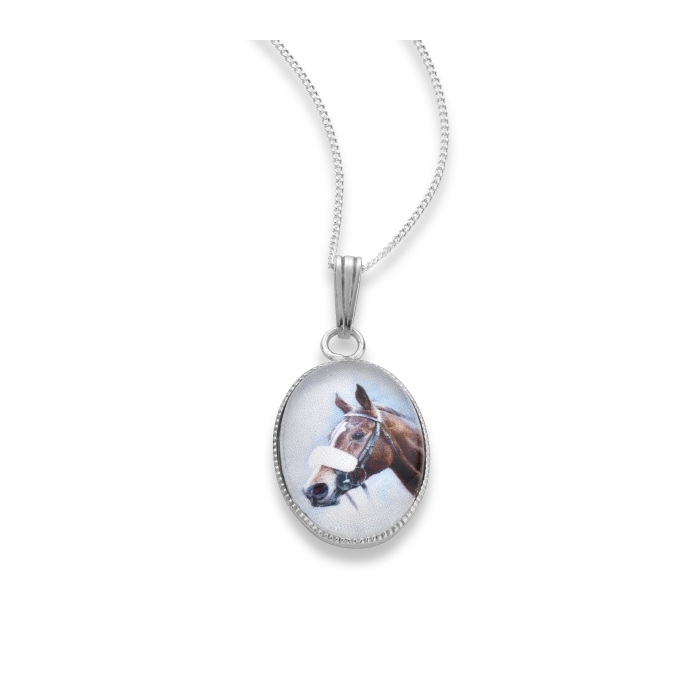 From your photograph we will create this truly unique piece of jewellery containing your favourite horse. An ideal gift for the equestrian jewellery (jewelry) lover in your life, we can preserve your favourite horse forever in a piece of classic jewellery (jewelry). Company Logos can also be added. Oval pendant measures18mm x 13mm and the chain is 40cm long. Both presented in our black leatherette presentation box.